Chef Shiitake (Cook Oosaka in Japan) is a gruff yet masterful chef and #1 food critic. Surprisingly, Shiitake was Kawasaki's teacher, though even under his teachings he never really learned to cook properly. In the episode The Big Taste Test, Escargoon gets wind that Shiitake was visiting Cappy Town and begged the king to get a new head chef for the castle. 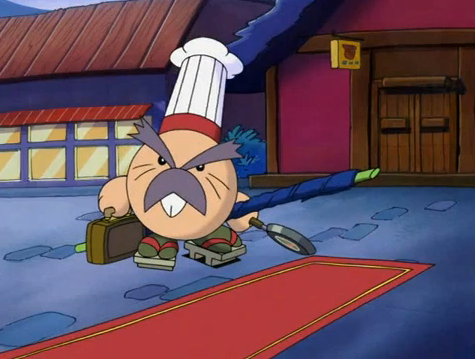 Dedede appoints none other than Kawasaki to be their head chef. Kawasaki wants nothing more to impress his teacher so intends to use the ingredient that his teacher has wanted to try for ages-- Zebon. Kawasaki is fooled into believing Kirby is Zebon, so he tries to cook poor Kirby instead. It is revealed that Shiitake was really Popon when he accidentally gives himself away by insulting Kawasaki's cookware that the real Shiitake gave him. The real Shiitake came much later in the series in the episode A Recipe for Disaster. Tiff and Tuff attack him thinking it's Popon again, but he convinces them that he's not with a display of fanciful knife work. Shiitake tries some of Kawasaki's food. He hates it so much that he decides to shut down his establishment. Dedede presents him with his own cooking show, and Kawasaki feels that he will run him out of business. Shiitake uses his show to embarrass Kawasaki. While snooping, Kawasaki and the gang come across the rare Gijira Extract, a powerful spice that can make anything taste good (in the original version it is a drug that makes the eater hallucinate and think that the food is good). Kawasaki calls him a false on national TV and reveals that he's drugging everyone into thinking his food is good. Later on, when Shiitake is leaving, Kawasaki asks him if he really used the extract. Shiitake says that the Gijira extract was going to be a gift for him to help out his business. Kawasaki feels awful and apologizes for ruining his reputation. Shiitake says that he wanted to show him that taste is something that can changed by adding even the smallest of things. He goes on to say that even though his reputation is ruined, in the end Kawasaki grew and learned from the experience, which was really all that mattered to him and was enough to make him happy. - Meaning コック "cook", オサカ "Oosaka"